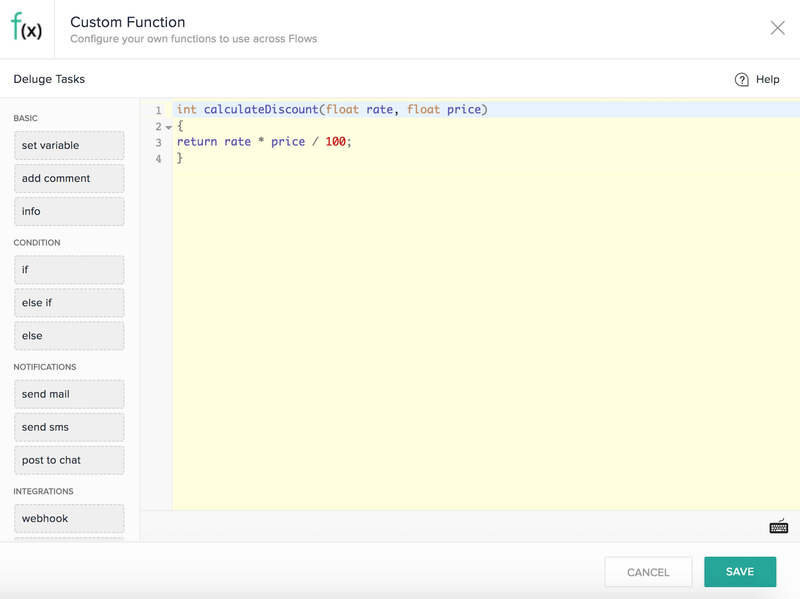 On Zoho Flow, you can write your own Deluge code to create custom functions to make your workflows more powerful. These functions provide flexibility to achieve complex workflows that simplify repetitive tasks. For example, you can create a custom function that calculates the discount rate for your invoice, or a function to analyze your support tickets and alert you if there is a negative statement. Custom functions can satisfy business-specific requirements by letting you write the entire function from scratch. Once created, they can be used by all members in your organization. Click the Logic tab on the left side of the builder. Enter a name. Remember that the name must start with a letter or underscore and can only include alphanumeric characters and underscores. Select a return type (output data type) and optionally specify the parameter (input) and its data type. The return type will be void by default. The input data type cannot be void. To modify the custom function code, click the edit icon on the function. Any member in the organization can edit or delete a custom function in the organization. The created function will now be available under Custom Functions in the Logic tab. Click Custom Functions. You can view the list of existing custom functions in your organization. 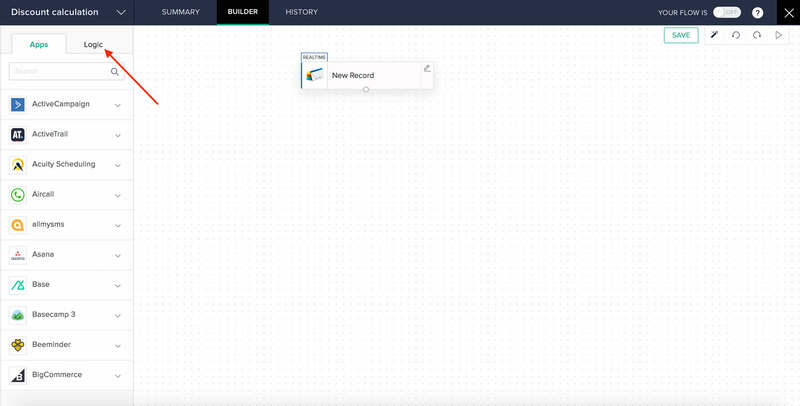 Drag and drop the function you want to use to the builder screen. A configuration window will open. Configure the function by entering the input parameter(s) of the function. You can edit the custom function data you configure by clicking the edit icon on the right side of the custom function. You can also delete it like other actions. On mouse over, the delete icon will appear. Click on it to delete the function. If a custom function is deleted, all the flows using the function will be affected. These are blocks of code available on the left of the custom function coding screen. Drag and drop them onto the coding area and enter the required data. Checks for a condition. If the condition is true, it performs the specified action. This checks if the client title is CEO. If it is true, the client type is set to premium. When neither if nor else if conditions hold true, the client type is set to regular. Your request for a new laptop has been approved. Please contact your IT administrator to collect it. subject :"Invitation to Sports club"
This function concatenates every value in the map. The output value of this function will be 'Emma Marley Becker'. Date-time fields must be converted into string functions before being used in custom functions or data mapping. This helps transform one date format into another and converts it into a string function. For example, if you are creating this custom function between a MailChimp trigger and a Zoho Creator action, map myDate to the date field from MailChimp. fromFormat will be MailChimp's date format and toFormat will be Zoho Creator's date format.